Synopsis: W.D. weaves a magical story of how music came to the people in Africa. At first The Ancestors kept music to themselves, but one grasshopper, Amani, discovered the beautiful sounds he could make and The Ancestors favored him with the gift of music. Gradually music spread throughout the land. Amani became friends with a man who was captured and put on a slave ship, and it happened that Amani was with him. Amani despaired at first, but his friend encouraged him to share his music. His music brought hope to those people who had been wrenched from their homes. As they rebuilt their lives, as slaves, on the North American continent, Amani continued to spread hope through his music. Activities/Resources: Although I couldn’t find activities specifically connected to this book, there is a wealth of activities related to Black History Month, to slave music, and to African-American history and storytelling. Here are a few links: from African Heritage, a wonderfully extensive list of links to free activities on an array of subjects ; from Teaching Today, lesson plans on Movement and Music: an Introduction to Slavery ; and from Lesson Planet, lesson plans on music and narrative in African-American history. 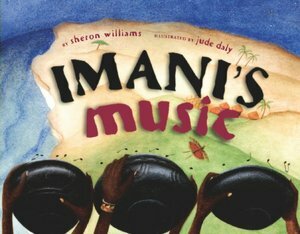 Children could also be encouraged to make up their own folk tales, to act out the story of Imani and his music, and to learn to sing some of the shouts, songs and spirituals that are a part of this period in African-American history. Availability: Unfortunately, this book is out of print. It is available in libraries, or in the used-book market from sites such as abebooks.com. What a shame it is out of print as that opening is so powerful and the whole magical birth and spreading of music is such a wonderful story to tell. I love the sound of this one, Beth. I can’t quite make out what the hands are holding on the front cover? The hands are The Ancestors’ hands, and they’re holding the bowls in which they stored the music — they’re pouring it out on the world. It is indeed a wonderful story, and I so wish it was still in print. This story does sound magical. Thanks for your review. Thanks, Penny. I so wish it was still in print, because it’s a wonderful story! Ooh, Beth, keep these types of books coming! This sounds so beautiful, and I love the rhythm of the opening lines. Lovely choice! Thank you, Renee — lots more cool books planned for coming weeks (although next week’s book is very different to my usual arts-related fare). Yes, the rhythm is wonderful Beth, and a story about bringing music to people for the first time is fascinating. Thanks! Thanks, Catherine. This book delighted me! This one sounds wonderful Beth, with the intro to African music. I’ll definitely be looking out for this one. Thanks, Jennifer — it is indeed wonderful. Such an imaginative story, and so well-told. I plan on going to the library for some things today. I’ll have to add this to my list of books to look for. Sounds rhythmic, beautiful and intriguing. Thank you so much for sharing. Hope you’re able to find it, Angela! “rhythmic, beautiful and intriguing” definitely are perfect descriptors. This sounds like a book I would love. I took an Anthropology class last year on the “Peoples of Africa” and I loved it. Since then, I have gravitated to books and articles about it. I love the opening for this book. The wording is really great. I will keep a look out it. Maybe they will reprint it soon. Good idea checking libraries. Hope you’re able to find it — it’s a lovely book. Another great choice for Black History month. Thanks! I hope you’re able to find it, Clar — it is a lovely book. This book intrigues me so. How terribly say that it is out of print. I hope to find it to buy someday, but for now will see if my library has it. Thank you for the wonderful review. Thank you, Robyn — I, too, hope you can find it! Sometimes I’m surprised what I can find in the library’s catalog. It’s worth a try. The library had some of its purged books at a sale last week. I found one that Enzo had checked out and enjoyed. I grabbed it. Beth, there were similarities in our selections today. I love the book you selected an hope it is in our library. Your opening was wonderful and the book sounds so lyrical. Music was so much a part of the was slaves passed down their stories as they sang about life. I think this will be a recurrent theme in other books. Very lovely review! Yes, I noticed the similarities between our choices as well. I can’t say that I’m surprised that we would think along the same wavelengths! Thanks, Pat. Wow, this one sounds gorgeous. I love picture books that feature music, and am excited to check this one out. Thanks, Beth! You’re welcome, Amy! Hope you like the book! Oh it’s too bad it’s out of print. It sounds GREAT! I’ll look for it in my library. I loved the opening to the story. Thanks for stopping by my blog (yeah, too bad I can’t snag all your toilet rolls ~ ha ha). Hope you find it in your library, Barb! I love your blog! Like the others have said, that is one powerful opening and I like how the voice/language is so true, you can hear it. I already spent a great deal of today at the library reading and doing some writing looking up publishers etc, hopefully I can locate it here, as I would love to read through the whole book. Thanks Beth. I hope you can find it, too, Diane. It’s a lovely look at how music came to be. I like folk tales and learning about different cultures. I just learned that people tell some folk tales through songs. Thanks for telling us about this book! Thanks, Erik. Isn’t it cool how music can be used in so many ways? Another excellent pick, Beth! I will see if I can track this one down. Thanks, Heather! Hope you’re able to find a copy! Vivian — I hope you’re successful in finding it. A couple of the libraries in my province had it available to borrow, so you might get lucky in that regard. I agree with Joanna-the opening is very powerful! As soon as I read that it was out of print I checked my online catalog to see if we own it-and we do! Tomorrow this book will be in my hands!! I will be sure share it with my students who visit the library. A great choice for African American history month. Thank you for this wonderful perfect picture book, Beth! Great news! Hope you like the book, Kelly! This book sounds lovely, Beth! I love music and am so happy to have you share books about it – wonderful for the kids and for us! I also love those “where things came from” kind of tales. Thanks so much for sharing this – it will be a great addition to our list! It’s an interesting process, hunting out books that are about the arts, and still work as “perfect” picture books — many of the books I find do not. I wish that all the books I *do* find would be still in print.